The design process is no longer limited to one group of individuals: novice designers are able to access more and more tools to bring their visions to life. As materials begin to evolve and change shape, having a set of rules with which to evaluate, interpret, and design them will become increasingly important. As we move towards tools that allow us to design and create our own materials these two worlds must be connected: in this research I strive to quantify and understand these more emotive aspects of materials, such as haptic responses to, cognitive evaluation of, and emotive perception of materials in order to understand how materials communicate meaning. One of the difficulties with this process is the existing rift between the science and design communities: while engineers understand and value the functional and technical properties of matter, they often ignore the human element, and designers often do not understand the fundamental properties that produce the effects they desire. The question that motivates my work is how can we connect the quantitative and qualitative aspects of design in order to bridge the gap in order to ultimately maximize meaning in design and creation with and of materials, particularly emerging ones that are unfamiliar. 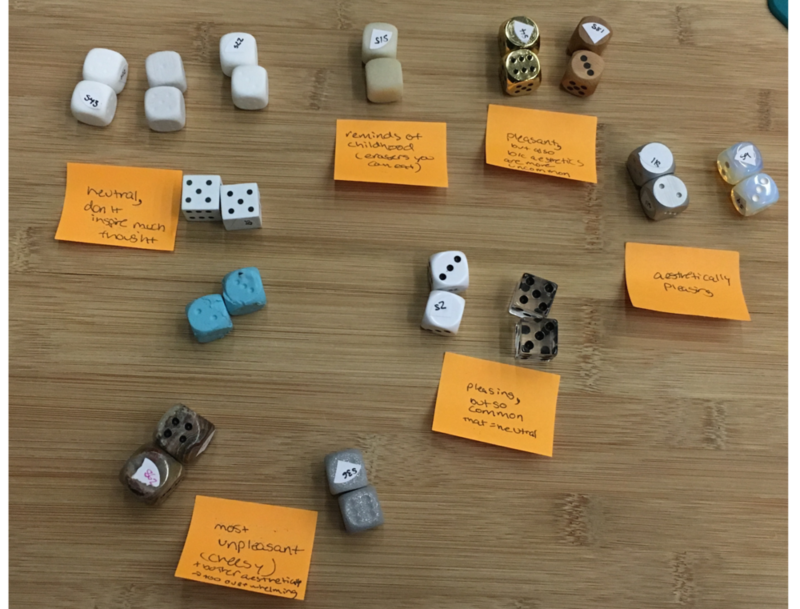 Essentially, my aim is to produce a set of guidelines (or a “language”) to allow designers and scientists to communicate and help creators understand the implications of emerging material combinations. For those without the resources to conduct time intensive user studies for every project and without the intuitive knowledge of a professional, it can be very difficult to predict the implications of materials and their impact on the interaction. As a byproduct of this research, it will be possible to create a digital tool that would map material parameters to emotional responses in order to guide users toward a more hollistic material selection process. By combining materials to maximize properties, I plan to go beyond existing databases and fabricate objects designed to evoke specific reactions. In developing an effective methodology, I hope to enable fabrication of more engaging objects. In conducting this research, I plan to establish guidelines and a provide a common language to enable de- signers to influence future materials and materials development. I hope to connect designers and researchers in a more effective way than is currently possible, and thus promote unique research of materials and expand their range of use. Such a tool will enable new design practices by adding emotive factors that are not rigorously understood to the material selection process and in the fabrication process. By incorporating qualities that were not previously quantifiable, I will encourage a more interactive design process that allows for the production of experiences that are tailored to an individual preferences. At its core, materials science is the study of how the structure and processing of materials can be used to control the properties of compounds. Through this work, I plan to help designers and scientists go one step further, and use material combinations to connect directly with the end user. How metamaterials interact with energy at different scales. The problem of material design becomes even more confusing when we consider newer material systems on which little information exists. One particularly intriguing example is the emerging field of metamaterials. Metamaterials are artificial media structured on a size scale smaller than the wavelength of external stimuli. Whereas conventional materials derive their characteristics from properties of atoms and molecules, metamaterials enable us to design our own atoms or structural units and thus access new functionalities, which can be carefully tailored. due to the high degree of control we can have over their functionality, they afford an interesting opportunity to evoke specific reactions.